This Craftsman facade is overflowing with curbside appeal. The metal roof over the box-bay window, twin arches and dormers make up a stunning facade. The interior is designed for families that love their entertaining spaces to be open and inviting. Accented by a striking cathedral ceiling, the family and dining rooms gracefully flow into one another creating a seamless transition for relaxing after a formal meal. Also open is the adjacent living room with fireplace, perfect for after-dinner conversation. 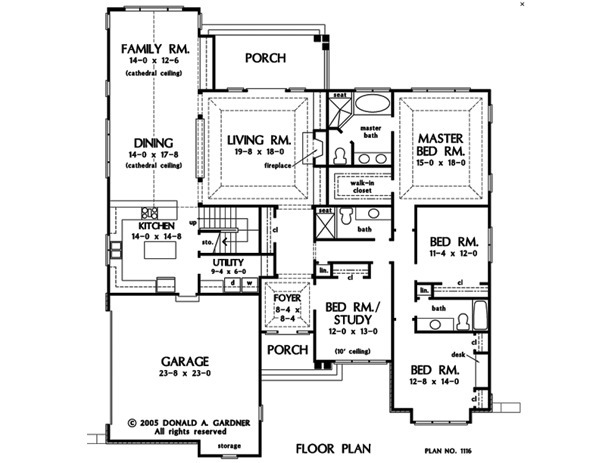 Tray ceilings crown the master bedroom, living room and even the foyer, granting an impressive entry into the home. The bedrooms are positioned near one another, so family members are always close by. 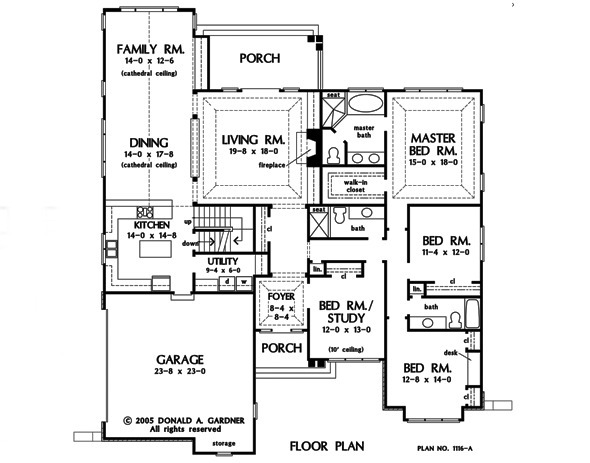 The master suite is complete with a spacious walk-in closet and master bath with separate shower and tub combination. 1st Floor: 2695 Sq. Ft. 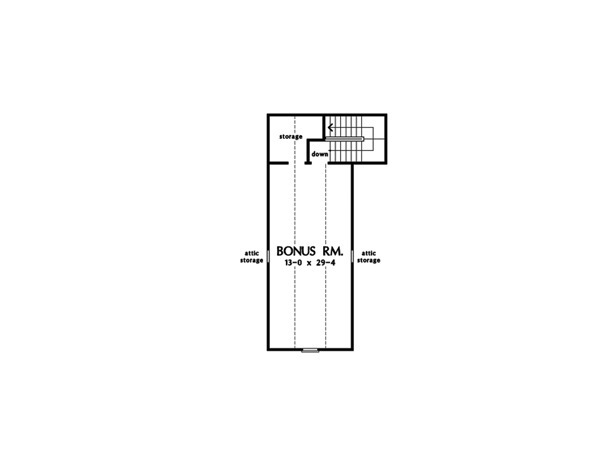 Bonus Room: 470 Sq. Ft.
House Dimensions: 60' 8" x 71' 4"
Great Room: 14' 0" x 12' 6"
Master Bedroom: 15' 0" x 18' 0"
Foyer (Tray): 8' 4" x 8' 4" x 11' 6"
Dining Room (Cathedral): 14' 0" x 17' 8" x 16' 8"
Great Room (Cathedral): 14' 0" x 12' 6" x 16' 8"
Kitchen : 14' 0" x 14' 8" x 9' 0"
Utility Room : 9' 4" x 6' 0" x 9' 0"
Bonus Room : 13' 0" x 29' 4" x 9' 0"
Garage : 23' 8" x 23' 0" x 0' 0"
Garage Storage : 9' 4" x 2' 4" x 0' 0"
Master Bedroom (Tray): 15' 0" x 18' 0" x 10' 6"
Bedroom / Study : 12' 0" x 13' 0" x 10' 0"
Bedroom #4 : 12' 8" x 14' 0" x 9' 0"
Porch - Front : 8' 4" x 5' 10" x 10' 0"
Porch - Rear : 18' 1" x 8' 8" x 11' 4"
Living Room (Tray): 19' 8" x 18' 0" x 13' 4"
Storage (Other) (Sloped): 2' 0" x 3' 4" x 0' 0"
Storage (Bonus) (Sloped): 8' 6" x 7' 4" x 0' 0"